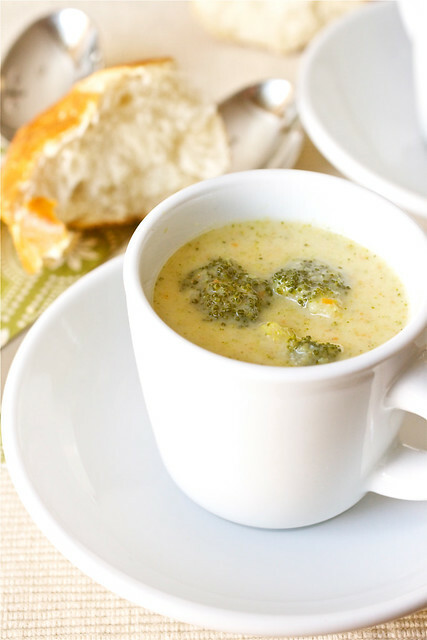 Broccoli Cheddar Soup: A Panera copycat version, this soup can be made as indulgent or healthily as you want with just a few small tweaks to the recipe. In the midst of holiday preparation craziness, there was this soup. Broccoli cheddar soup. A knock-off of the famed and beloved Panera version, this version is a lighter homemade version where you control the ingredients. I love soups like this one! I’ve made this broccoli cheddar soup recipe a handful of times over the past few years and I seem to make it a little differently each time, mostly just varying the milk ratio (i.e. sometimes adding a little cream in place of some of the skim milk), but it turns out fabulous each and every time. The consistency isn’t as thick as Panera’s version but like I said, it’s on the lighter side, so if you want to thicken it up, just increase the cream-milk ratio. And aside from a regular weeknight meal, in the past I’ve also made a double batch of the soup, kept it warm in the crock pot, and served it in coffee mugs as a warm appetizer during fall and winter parties. The most recent time this soup appeared in our kitchen, I was in the middle of packaging up my Christmas treats over the course of a few days and because the recipe left us a fair amount of leftovers, it was so nice to be able to quickly heat up a bit for lunch. This broccoli cheddar soup is always a big hit here and has definitely one of our favorites over the years! Feel free to adjust the type of milk or cream you use based on how thick and creamy you want this soup to be. For the lightest version, use all skim milk and a reduced fat cheese. For a super indulgent soup, use 1 cup each of whole milk and heavy cream along with full-fat cheese. In a large stockpot or Dutch oven, melt 2 tablespoons of butter over medium heat. Add the onion and carrots to the pan and sauté until tender, about 5-7 minutes. Stir in the broth, onion salt and garlic powder. Bring the mixture to a boil, add the broccoli, then reduce the heat to a simmer. Meanwhile, in a medium saucepan, melt the remaining butter. Add the flour and cook for 1-2 minutes until lightly golden brown, whisking constantly. Whisk in the milk and cook until the mixture thickens and bubbles, about 5 minutes. Once the mixture has thickened, remove the saucepan from the heat and whisk in the cheese until completely melted. Slowly pour the cheese sauce into the soup pot and stir to combine the mixtures. Allow to simmer until warmed through and broccoli is tender. Season with salt and freshly ground pepper to taste. If desired, puree the soup with an immersion blender for a smoother texture. Yum! This is definitely a cold weather staple- love the idea of serving it in mugs as an appetizer! What a beautiful photo – wowza. Thank you for reminding me to make this soup soon, perfect for the winter season. What a warm and comforting meal. Beautiful photo! Yum, one of my favorites! So delicious. Your picture turned out great too! Oh this is such comfort food. Thanks for posting a “lighter” version of it! I’m constantly looking for ways to lighten up my favs! Weird question…how did you get your recipes to be in that printable box? I’d love to add that to the recipes that I post! Jasanna: I use a WordPress plug-in for the printable box. I see that your blog is hosted on blogspot so this wouldn’t work but you can always check the blogger settings for something similar. Made this today and it turned out great – creamy without the cream! Great recipe. This is absolutely delicious!! I used Veggie broth 🙂 Yummm! YUM – this has got to be the easiest and most delicious Broccoli Cheddar Soup I have ever made! I even skipped the butter in the roux and did it with just milk/flour to save a few calories and it was AMAZING, thank you so much – will be sharing with my readers soon! I made this tonight and it was delicious, and relatively easy to prepare too. I added turnips to the mix and omitted the onions. Thank you very much for sharing. So glad you liked it! It’s one of our favorite soups and adding turnips is a great idea! Just made this for dinner tonight! Extremely yummy! This will definitely be on the menu in the coming months!